Peninsula Massage – What is Magnetic Therapy? Magnetic Therapy is an external aid to control soft tissue pain. This includes muscular. Joint and nerve related pain. All living matter is amagnetic i.e. it assumes the polarity that it is placed in. There is no resistance to the energy going through soft tissue. A magnetic field will induce a pain relieving effect by the process of induction i.e. it will create a current and ionise the trace elements flowing through the blood stream, For example iron is attracted to a magnetic field, and calcium is repelled from a magnetic field. 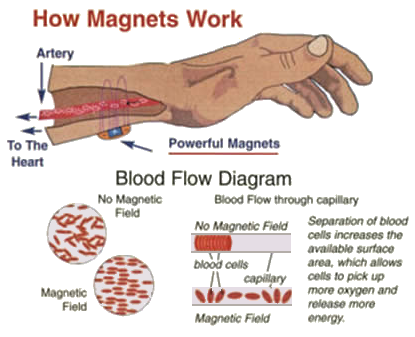 A magnetic‑ field will increase blood flow and reduce inflammation. The action of the north pole of a magnet is to dilate blood vessels. All monopole magnets are marked on the north side. The South Pole will constrict blood vessels and create an anti inflammatory action therefore acting as a diuretic to remove fluid. You will also hear of bipolar magnets…. They are both north and south poles side by side on the same face. North Pole magnets are used for poor circulation problems such as muscle cramping, pins and needles, migraines, stress headaches, neck and shoulder tension, cold feet, any symptom that feels cold to the touch such as arthritis and joint pain. South Pole magnets are used‑ correspondingly for any symptom that creates a hot sensation such as hot swellings around knees and ankles, anything that requires the reduction of fluid. There are some magnetic products that contain both elements of north and south magnets. These are more common in support products for knees, backs, ankles elbows etc. MAGNETIC THERAPY IS A RELIEF NOT A CURE.